is the student of two renowned stalwarts, Kalaimamani S.K. Rajarathnam Pillai and Padma Bhushan Smt. Kalanidhi Narayanan. With her natural aptitude for expression, abhinaya, coupled with her passion and dedication to her art, Priyadarsini has become a flag bearer of Smt. Kalanidhi’s padam (poetic) repertoire. Priyadarsini Govind’s unique blend of new choreography and tradition has seen her tour extensively in India and all around the world. She has given performances in over 35 international festivals, 22 international concerts and all major cities in India. and released her own range of instructional Bharathanatyam DVDs. Most notably, she served as the Director of the prestigious Kalakshetra Foundation between August 2013 and June 2017 and curated the highly acclaimed Natya Kala Conference in years 2012 and 2013. About Kamban Kazhagam Australia Inc – A registered not for profit organisation, Kamban Kazhagam Australia Inc was set up with the primary aim to promote and develop one of the most ancient languages of the world, Tamil (pronounced Tha – mizh). Kamban Kazhagam prides in making all aspects of the Tamil language accessible and enticing by organising and bringing distinguished and acclaimed artists such as Priyadarsini Govind to our shore. 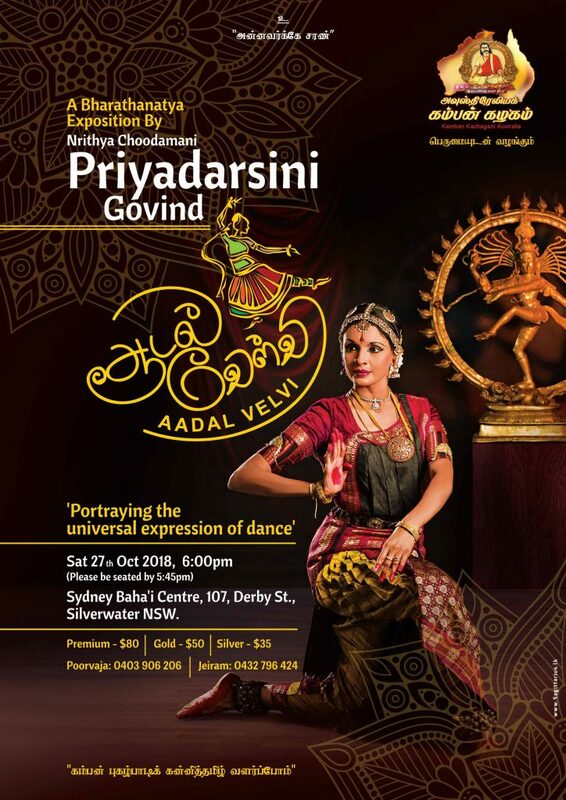 Their undying conviction and commitment sees Tamil prose and verse thrive in Australia through Music and Theatre reaching large audiences of all backgrounds and ages for the last twelve years.